Cloud(y) Conditions Don't Have to Mean Limited Visibility. IT networks are becoming more complex, network speeds are accelerating and the variety of monitoring tools are growing. Additionally, organizations are not just running applications in dedicated on-premises infrastructure; they are moving mission-critical workloads to the public cloud. As a result, IT and security teams must find new ways to secure and manage applications no matter where they are residing. Kirk Punches from Gigamon joins us to discuss how ExtraHop and Gigamon enable IT organizations to tap into their workloads for troubleshooting, capacity planning, security monitoring and other real-time insights in the public cloud. I am Sr. Manager, Cloud Alliances at Gigamon. I've spent many years helping companies plan their new business ventures in the public cloud. At Gigamon, I was brought in to help the company navigate the new ecosystem of partners, channels, consultants and customers required to expand the company's growth and success in traditional on premise and private cloud business into the public cloud. I am part of a core team formed to transform any aspect of Gigamon's business to accelerate the adoption of public cloud. Prior to joining Gigamon, I spent time at both Amazon Web Services and Microsoft, advising companies how to best align with the cloud providers to achieve successful business outcomes. The cloud offers unbeatable scale and elasticity -- but it also comes with risk and complexity. Migration of applications and infrastructure is a complex process that requires careful planning and deliberation. And once those applications are in the cloud, you need a way to benchmark performance, manage VMs to control costs, and ensure the performance, availability, and security of the critical systems on which your business relies. Visibility across on-premises, hybrid, and cloud infrastructure is key for mitigating risk, reducing complexity, and assuring performance and availability of mission-critical applications. So, why is visibility essential in the public cloud? Simplify migration: Auto-discover and auto-classify all IT assets, document application dependencies, and set baselines before the move. Hold vendors accountable: Gain real-time access to performance metrics to keep your critical applications running. Analyze cloud spend: Gain visibility into all cloud assets to understand what's happening and optimize the use of cloud resources. Secure operations: Monitor all traffic, including intra-instance traffic, to improve your security posture in the cloud. What are some of the benefits for our mutual customers deploying applications on AWS? As part of the shared responsibility model, how you assure that AWS is being used securely by everyone in the enterprise? How do I run more mission-critical apps on AWS while meeting the needs for applying compliance and security controls? If zero-day security vulnerabilities are exploited in software that is yet to be patched, what backstops do I have to detect them? How do I detect and respond to security or network anomalies while deploying applications on AWS? 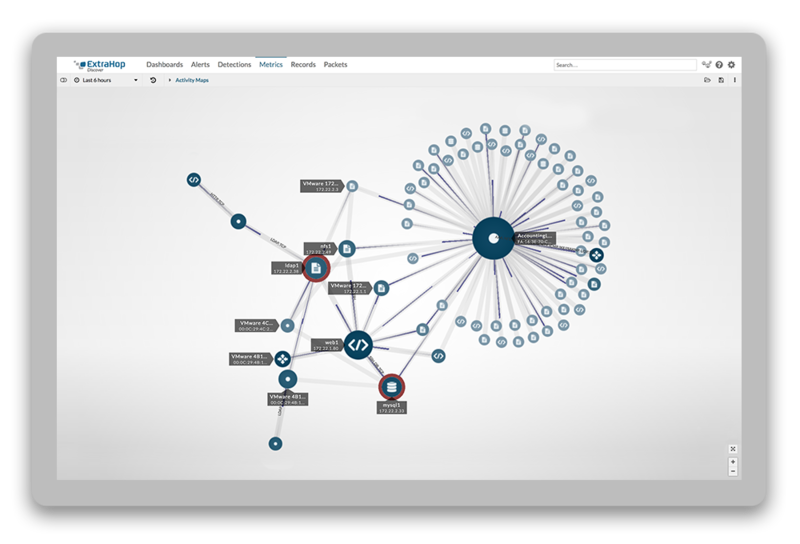 Together, Gigamon and ExtraHop offer the necessary visibility and network traffic analytics that enable enterprises to improve performance, security, and the user experience. The Gigamon Visibility Platform for AWS provides network traffic visibility and traffic intelligence for mission critical workloads in AWS while ExtraHop offers the visibility and contextual awareness you need for a successful migration to and monitoring of cloud infrastructure. How does ExtraHop integrate with Gigamon on AWS? The joint offering from Gigamon and ExtraHop provides an easy deployment for AWS, as depicted in the figure below. The Gigamon Visibility Platform delivers network traffic visibility for workloads running in AWS and enables increased security, operational efficiency and scale across VPCs. With Gigamon, enterprises can maximize application performance by reducing agent overload via a lightweight G v-TAP agent with minimal impact on AWS EC2 CPU utilization. The platform integrates with AWS APIs and deploys visibility tiers in all virtual networks (VPCs) that collect aggregated traffic and apply advanced intelligence prior to sending selected traffic to ExtraHop. The G v-TAP agent copies network traffic from each EC2 workload instance and sends encapsulated traffic to the GigaVUE V Series. The V Series identifies the appropriate traffic flows within the network, and manipulates and filters that network traffic before delivering it to ExtraHop for analysis. The V Series can also slice, sample, or mask network traffic to ensure only traffic of interest is sent to ExtraHop and other tools that may be deployed for security monitoring. Check out the Gigamon Visibility Platform for AWS.